And not in a good “family game night” kind of way either. Cubs lost to the Giants today and the Rockies defeated the St. Louis Cardinals. At the start of the day our elimination number was holding strong at three. After these two events, our elimination number is down to one. And unless a miracle happens, this will be the last day of the season that I post while we’re still in contention for a playoff spot. Unbelievably the American League is down to only two teams left vying for the final playoff spot. The rest of the league is out. National League proved to be a little more competitive this year as five teams are still left competing. Surprisingly, Atlanta has jumped up to second place, only two and a half games behind the Rockies after their recent six game win streak. Their elimination number is five so the rest of this week should prove to be interesting for both the Braves and Rockies. It’s only a matter of time (barring miracles of course) for the rest of the teams listed that are still in contention. This is why it’s important to kick the season off fast, stay strong and finish strong. Every game counts when you tally it all up and look at the big picture. Those one run losses early on may not have seemed like a big deal then. Now, you’d love to have those turn around into one run wins. Would make a huge difference. 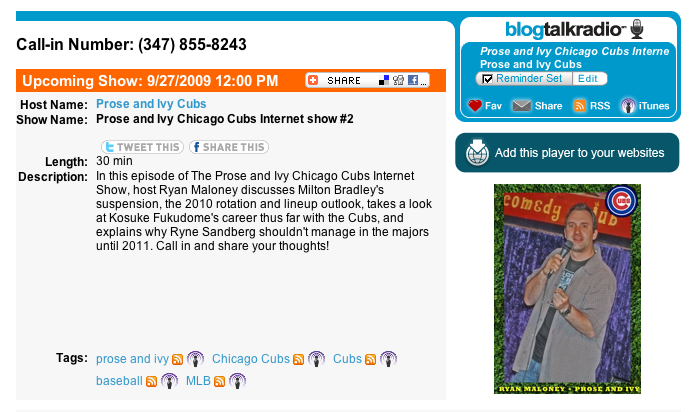 Play the episode of today’s Prose and Ivy Cubs Blog Talk Radio show I recorded earlier today, listed in the side bar on the right. My take on Bradley, next year’s line up and rotation, use of the young talent, Fukudome’s worth and what it all means looking at 2010 is discussed on the show. Enjoy the talk now and leave a comment or two while we’re technically still in it. One loss or one Rockies win and our ’09 will officially wrap come the final regular season game. The rest of the way we play at Wrigley where we are much better than we are on the road. Maybe that will matter and maybe it won’t. Unfortunately that’s the stressful and depressing part of losing control of your own destiny. One to go. Will it come Tuesday? Will it come at all? Hope not. We’ll see. On top of playing at home, we’ve got Pittsburgh coming to town. We know how I feel about Pittsburgh…wish we could play them all 162 games. The Rockies on the other hand have Monday off as well and then face the Brewers. Can’t imagine the Brewers would like to do us any favors. Doesn’t look good. But again, we’ll see. Dempster at home against the Pirates on Tuesday. All we can do is our part and hope for the best. Go Cubs Go! Call in and share your thoughts on all things Cubs. Here’s the description for today’s show! Wells goes for win number 12 today in San Fran. Keep those W’s coming! Go Cubs Go! Oh no. Two years of division titles in the Central for the Cubs and that is where it stops. Cubs are hot lately but it’s too little, too late if you were hoping for a three-peat. Cardinals beat the Rockies tonight in the ‘I really don’t want to root for either of these teams Bowl’ and clinched the NL Central. They had the better season. Their superstars had the better year. Their pitchers stepped up and outperformed us. Congratulations to the St. Louis Cardinals for taking the Central. Now we’re looking at the Wild Card. Granted, we’re looking at it with horrible seats but at least we got tickets. A few teams are standing in our way of claiming the Wild Card and our down in front chants aren’t doing much in making a difference. It hasn’t seemed to work in our favor this last month of the season no matter what we do. It seems any time we pick up a game on the Rockies, so does everyone else. And if we lose a game, well, they do too. And the Rockies have pulled a ton of comeback wins out making our late season heroics attempts moot. We’re not out of it yet and it’s becoming quite the final couple weeks of the season. Don’t know that I’d use the word ‘wild’ to describe it, but at least the games still mean something anyway. For three more games that is anyway, possibly less. Our elimination number is down to 3. Any combination of Rockies wins and Cub losses that add up to three and we’re done. These few games against the Giants have been a blast. I must admit, when I saw Zambrano v. Lincecum as the opposing pitchers the other night, I thought we were toast. Figures that’s when Z steps up and delivers his best pitching performance since his no-hitter a year ago. Also figures that while Lee has been on a tear, he just happens to be the guy on base in front of Baker, who just happens to hit a 2 run shot to win a ballgame in the ninth, who just happens to drive in Lee, who just happens to be the victim of an overzealous Guzman celebration, who just happens to hit Lee (not Baker, who actually hit the home run) and who just so happens to injure Lee’s neck while doing so causing him to miss a couple games. And that my friends is what we call the Chicago Cubs. I wish this team would continue to play all out while we aren’t mathematically eliminated but it has been nice seeing the young talent shine. I understand being careful with guys for next year, but since we’re still in it…I guess since we’re still in it, it does bother me a little shutting down guys like Harden and being so careful with Lilly who’s been our star all year on the mound. And in total contrast, if you’re giving up on the season and looking to next year and giving guys a bit of lighter workload, why are we allowing Dempster to push to try and reach 200 innings? Who cares if Demp wants to hit 200? You want to save him and make sure his arm doesn’t throw any unnecessary pitches in 2009 we could use in 2010…then allowing this push to 200 is something I just don’t get. Gorzellany has been great and the lineups and results have been working in our favor, but really who would’ve thought that’d be the case. I kind of feel like the organization gave up on the season too soon and have simply been lucky that the make shift line ups have come through the way they have. So here we are three games away from elimination. Let’s just keep playing hard and see where the chips fall. Central is no longer a possibility…but let’s keep pushing and see if we can somehow make our way down front and capture the wild card. Never know. Right Yogi? Wells up again tomorrow. Do your thing Wells and get that W. Go Cubs Go! One of the most exciting seasons in Cubs history happened 25 years ago and the pinnacle moment of that season happened exactly 25 years ago today. Happy 25th anniversary ’84 Cubs. A few videos to celebrate the memory of that exciting Cubs season. Both are interview clips with Rick Sutcliffe…this first one, man. Talk about a tough act to follow. These videos come off of ESPN.com and its great to hear thoughts of that amazing Cubs year from someone smack in the middle of the whirlwind of reasons as to why it all happened the way it did. Something that would be great for Bradley to hear now too…maybe if he hears enough former and current Cubs talk about how lucky he is to be a Cub, maybe it will help him realize what he has if ends up staying or what he had if Hendry finds a taker this off-season. The domino effect of events that had to happen in 1984, to end the way it did and claim the title that they did is a pretty amazing story. One that almost lets Hendry completely off the hook when it comes to the Bradley signing. I have taken him off the hook completely and feel confident in Hendry making the deals in the off-season to see if it makes the difference in 2010. No one thought the moves the Cubs made would put them over the top and back into the playoffs. But they did. And trades and signings that the organization and fans get excited over, ones that they have high hopes for can just as easily surprise and disappoint. The 1984 Cubs had a young, all-star caliber talent in Ryne Sandberg and a bunch of guys that no one saw coming. It all just kind of fit just right and put the Cubs in the playoffs. Sure, we all want the Series title…aiming to make the playoffs is never the ultimate goal, simply the first necessary step to get there. But imagine if we were celebrating and enjoying a team like this today. I don’t think any one of us would complain about that. Happy 25th anniversary 1984 Cubs. May you be one highlighted season among those that eventually, hopefully shortly, get us to the ultimate prize. Go Cubs Go! Tyler Colvin’s debut last night was pretty smooth, impressive and the future looks bright. Watching the game right now and working on my film festival. 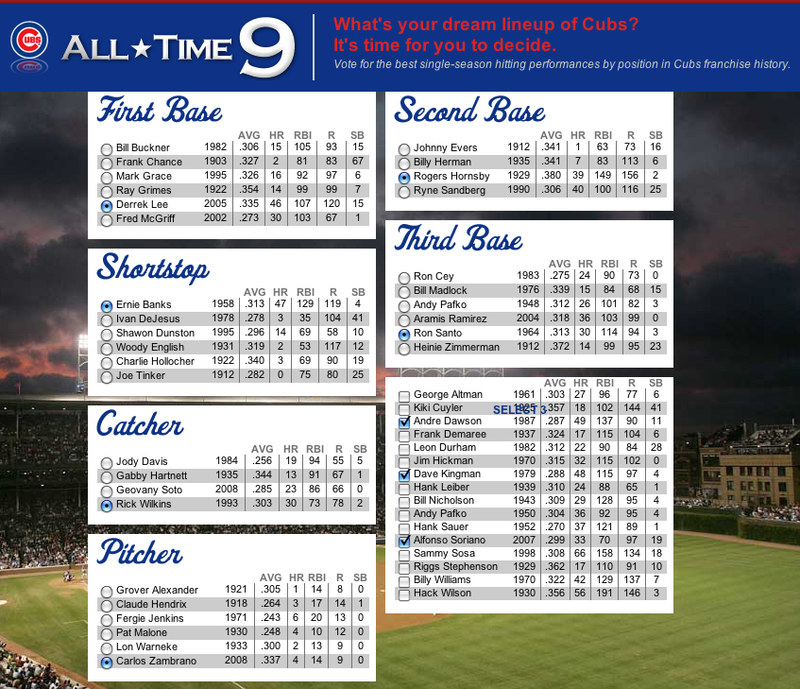 Don’t generally put things in here outside of Cubs baseball unless I’m really excited about it….this is one of those things. I am organizing a film festival in my hometown of Manchester, CT for Columbus Day Weekend, Oct 8-11. A film I’m in is screening and about 75 other films that were submitted are screening as well. Here is the website for more information here. The festival is called the Silk City Flick Fest after the silk mills the town is famous for and it’s going to be an amazing feat to pull off. Four days of filmmaker panels, screenings, galas and awards. Living in New York it’s been tough to contribute as much as I’d like but the people working on it back home have put together quite a lineup. The schedule is listed on-line and more information is being listed every day. I’m doing a film on the Cubs for next year’s festival and working out the exact angle I’ll take. Would want to do something different than what’s been done before. Kids Get Dead – Trailer from Darkstar on Vimeo. If only Lee didn’t wait so long to turn it on this season. If only Bradley wasn’t turning out to be what we were warned about as fans. If only Soriano had a healthy knee. If only Ramirez spent more time on the field and less time on the DL. If only Soto hadn’t had the munchies this year. If only Z was performing like a real ace. If only Lilly and Wells had more run support. If only Dempster wasn’t screwed over by a lame offense as well. If only Reed Johnson hadn’t followed it off his foot. If only Lou had gone away from Gregg as the closer sooner. If only we’d kept DeRosa. If only we had room on the roster for Hoffpauir and/or Fox. If only Miles wasn’t occupying a spot. If only the Rockies hadn’t found that hot streak. If only Pujols didn’t have another killer year (and by killer I mean Cub killer). If only it wasn’t 11:40pm on the East Coast. I’d go on and on. But it is. And overall, it is, what it is. All of these things have happened this year and we are where we are. Incredible win over the Brewers tonight only by far a perfect or strong outing overall. Zambrano nearly gave up way too much before he left. Milwaukee couldn’t throw a strike if their life depended on it walking in and hitting people to give up more runs than the Cubs actually earned. We’ll take it, sure…especially with the Cards losing tonight and the Giants (also fighting for their Wild Card life) on top of the Rockies as I write this…which means…the Cubs could gain ground in the Central and the WC race. Nothing to complain about there, but still, it is what it is. Fourteen games left. Need to keep winning. St. Louis and Colorado are very strong and are not going down without a fight. We need to keep winning and let the chips fall where they may. Soriano had successful surgery today which is great to hear. We need him ready for the Spring so sooner the better with regards to the surgery. And of course, Lee needs to keep his hot streak up. He hit the 100 RBI mark tonight which is incredible that he could have a .300 30+HR and 100RBI season this year considering the way the season started for him. Love seeing him do well…just need to continue for another 14 games and then we’ll see. Continues tomorrow against the crew….Harden vs. Looper. No one has the obvious nod between the two of them as far as I’m concerned. Do your thing Harden and get that W! Go Cubs Go! Today’s broadcast of Prose and Ivy Cubs Blog Talk Radio went really well I must say for the first live broadcast. I didn’t get word out nearly early enough for people to know about it, mark it on their calendars and call in. But the technology is really cool and I think it’s going to be a blast to do in conjuction with the written aspect of Prose and Ivy. I’ll be sure to let you all know when the next broadcast is going to be well in advance this next time so you can call in and share your thoughts. Talk radio is a whole lot cooler when people call in…er, even listen for that matter. Next time, more advanced notice for sure. What I didn’t see coming, was the final score of Reds 7, Cubs 5. Sonnufa….I swear. I left my apartment and it was 5-5 going into the top of the ninth inning. Marmol was in and I figured we were good. I can’t believe he walked two in a row. That’s the real surprise. Sure, Marmol has a tendency to be a little wild. But his stuff his undeniably nasty and I stand by it that he is the Cubs best option for closer and should have been the guy since Opening Day 2009. Going into 2010 I also believe he should be the guy. Unless he happens to be taking off guys’ heads like Rick Vaughn did to wooden displays of batsmen in Major League, honestly, he’s our guy. So, I’m on the talk show boasting about Marmol being the guy…I hang up (the show is recorded from your phone)…I look at my email and there’s a message with the final Cubs score….Reds 7, Cubs 5…loser? Marmol. Sonnufa…well, whatever. I don’t know…we didn’t deserve to be tied in the ninth anyway. Unbelievably poor support of Wells today. Unreal. If it’s not inconsistent hitting, it’s poor fielding. Our starters can’t catch a break. Read an article on Cubs.com today that reinforced my comments on air regarding quality starts from our rotation this year and how our team’s bats have pretty much taken them and thrown them away, never to matter again. It’s really unbelievable when you think that our starters have a 3.76 ERA and we’re on the cusp of being eliminated from playoff contention, whereas last year we won the division with the same group of guys basically, and they had an ERA of 3.75. Two solid years from the rotation. Two very different results. Whatever moves are made in the off-season, I hope they revolve around studying how clutch guys are and what they’re average is with guys in scoring position. I hope that is taken into great consideration. That, and speed. Maybe if we can find a couple guys with high OBP’s with some speed and timely hitting, maybe THAT will put this team over the top. Maybe it’s not a ‘left handed power hitter’ that we need now or really needed this past off-season. Maybe it’s simply a couple of speedy small ball guys to jump start the offense and fill in the necessary grind in between the large bats we already had on the team who are paid to go yard. I don’t know. I just know that as soon as I saw the email with the final game result with Marmol as the loser, I just said out loud “well, that figures”. Left my apartment to do the radio show as they were entering the top of the ninth. We had overcome an inning filled with three errors early on to tie it up and now our most reliable bullpen guy was on the mound. I thought, hey, this looks good to me. Went out and put out a passionate plea to anyone who would listen to make Marmol the guy from here on out and through 2010. Bam. Two walks and a double. Reds win. Marmol loses. Didn’t see that coming. Also didn’t see this coming either…apparently a pretty cool sports blogger conference that happened in June in NYC. Another one coming up in Vegas in October. My wife was upset that I watched 5 innings of Cubs baseball on my honeymoon one afternoon (she got over it and was cool afterwards, but at first…not so much)….imagine if we’d been married in October and I snuck off to this? Now that would have made for an interesting radio show. Check it out, pretty cool concept. Hope to catch the next one next time they do it in New York. Cubs v. Reds again tomorrow at Wrigley. Mr. All-Star Theodore Roosevelt Lilly on the mound for the Cubs. Go get your W Teddy Mustwin (see a couple of posts below this). Go Cubs Go! Prose and Ivy on-line Talk Show Today 3pm CST! 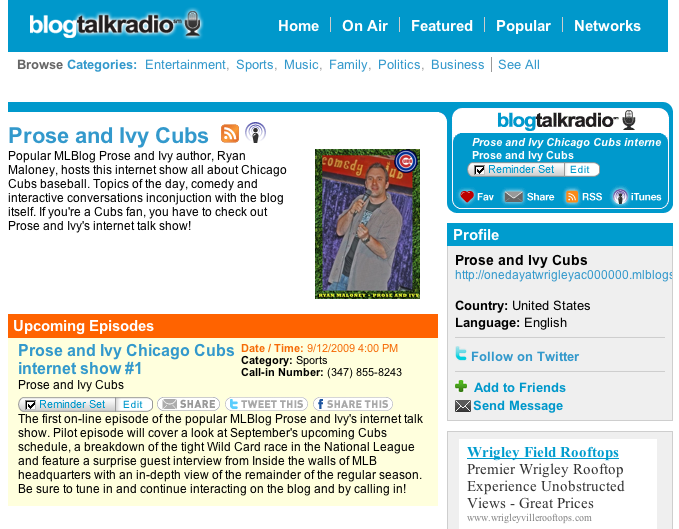 Hey Prose and Ivy readers/Cubs fans…today features the first episode of the Prose and Ivy Cubs internet talk show and you can listen in by clicking on this link. The show details are listed below. Hopefully there aren’t any glitches because I haven’t used the system before…we’ll see! Feel free to call in and talk Cubs baseball! The Rockies have surged their way to a last at-bat victory once again and matched the Cubs sweep of the Pirates with a sweep of the Reds. Unbelievable. Bring on an eight game series with the Rockies right now and let us sweep. That may be the only way we make up enough ground to take this thing over this year. And you know how likely that is. Unbelievable. Cincinnati….you disgust me. Thanks, for nothing. Have to keep winning or else we’re definitely through. They sweep September and we sweep September, more power to them. Finish strong like Lou says, our only remaining option. Day to think about it tomorrow. Come Friday, we need to keep this Cubs W streak going. Go Cubs Go! Maybe a little too late….like Lou’s pep talk. It’s apparently lit a fire under the Cubs but now instead of controlling our own destiny, we need to rely on sad teams like Cincinnati. They haven’t done us any favors this week against the Rockies as they keep losing and the Rockies keep matching us result for result. At this rate we’ll gain no ground and that’s what’s so frustrating. Relying on teams that can’t hold a light to true contenders is no way to spend September. 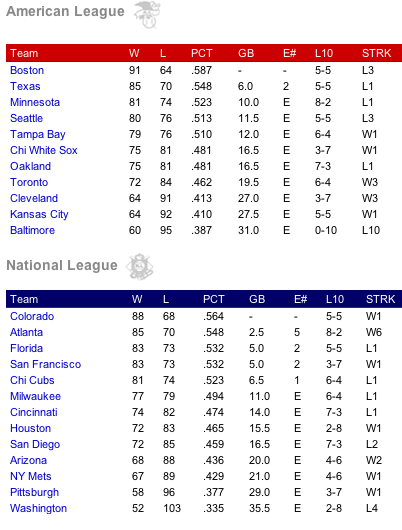 Yet here we are…we need to keep winning though in order to have a shot at grabbing the wild card. The Reds are currently up 3-2 in the top of the ninth so we’ll see. Would be nice to pick up a game tonight though. What do you think Cubs fans? Would you vote differently? Why? I’ll break down my rationale over the next couple days. Wanted to get this out there today though while it was still 9/9/09. Off day tomorrow, then back at Wrigley, Harden vs. the Reds. Let’s hope Cincy can do us some favors there and fall to the Cubs the way they gave this past series to the Rockies. Go Cubs Go! There is an old children’s joke that reminds me of this Cubs season. As soon as we hit seven games back I felt that it was too much to overcome and that loss ate up any chances we had of winning this thing in ’09. Add to it the fact that the Rockies keep winning and the rest of the pack keeps losing and they are separating themselves even farther in this wild card race. Both the Cubs and the Rockies are 5-5 over their last 10 games. However, the way those wins and losses fell, we’ve lost ground on the Rockies and are now eight games back in the wild card standings. I can’t believe publications and outlets like ESPN even include them on their NL Wild Card standings/contenders lists any longer. I mean, again, it would take a miracle. So why not list the realistic chances only. Anyone who hasn’t been mathematically eliminated would require a miracle to make it in, so in that case if you list the Cubs, might as well list everyone. Our line up was sorely missing Lee as his return to the lineup included a couple of home runs and a victory against the Mets. Putting all of that pressure and urgency on Wells’ starts in September is just too much for a rookie to realistically come through with so it’s no great surprise that Wells is proving to be unable to carry his weight through September. Zambrano’s been touch and go, Demp hasn’t done anything special and there’s been no run support for Lilly or Wells. So in that case we have to keep hoping Wells, a rookie, figures out a way to win and it’s just been too much. Another Cubs loss today and a Rockies win. An unfortunate pattern as of late. I think I had the Dodgers winning the West and the Giants taking the wild card before the season began so if not the Rockies or Cubs, I suppose for my own record, the Giants are welcome to win the WC. The way this season is ending will raise lots of questions in the off-season. Another starter needed? A closer? A new manager? Use some of these class, talented youngsters to get a big name to win now with guys like Soriano, Lee, Ramirez and Bradley playing and getting up there in years? Trade any of those guys in a blockbuster trade and perhaps that will make a difference? I don’t know. But the off-season will provide a ton of questions, predictions, analysis and trade proposals. Hendry will have his work cut out for him in figuring out the last few moves necessary to mold this roster into a World Champion team. Until then, we still have 27 games left. Eight games out. Has seven ate ’09? Probably. But if the math works in our favor, then history may as well. And if that’s the case, the off-season business may be a lot different, the chemistry may be okay and the language we hear will be something entirely unexpected. First of the 27: Lilly against the Pirates. We’ll always have Pittsburgh is a popular saying here at Prose and Ivy. Tomorrow, we’ll see if that’s still true and if so, whether it makes any difference or not in the standings. Go Cubs Go! It happened. We’re seven games back. I thought six games would be a lot to make up in a month…seven I think is going to be too much. Any result that puts us in the playoffs this year I’m afraid would be a miracle at this point. Harden pitching today against the Mets. Heading to see some family for the annual Labor Day weekend luau. Hope my cell phone has some good news for me later today. Full recap of my time at Citi last night for the Cubs/Mets game is listed in the post below this. Go Cubs Go! We have no shot at making up ground in any race if we decide to match those above us win for win, loss for loss. The Cubs just wrapped up a pathetic 5-0 shutout effort against the crosstown Chicago White Sox. And the whole game was a horror to watch, aside from Dempster that is. The Rockies are currently down against the Mets in the seventh inning 6-2. Chances are they will lose. The Cardinals are losing 4-3 in the bottom of the ninth. As we all know, with the Cards this year, anything is possible. But if they lose, yet again we’ve successfully combined our outcome with the Rockies and Cards and matched them result for result. Forget the division, no threepeat, I get it. But the Wild Card is not impossible. Not if we win and they lose. Will they lose? Yes. SO…WE HAVE TO WIN. A pathetic 5-5 showing in the homestand and now off to New York to take on the Mets. The Mets, who could only potentially take one of three against the Rockies, not helping the Cubs at all. The Mets, who could possibly find a way to turn it on against the Cubs this weekend and do some more black cat voo-doo by sweeping the series while the Rockies blow up, not guaranteed or likely, but it wouldn’t be surprising the way things are going. And to the Sox! Vomit. I said yesterday, no one better to play spoiler against than your crosstown rival. Unfortunately the Cubs ended up on the wrong side of the final score and the fans in black left Wrigley happy today. With the Rockies losing we lose a chance to make up ground but at least if the Mets hold and close this thing out, we won’t lose any ground. Just such a shame to see the scoreboard and see the Rockies losing and know that we blew a chance to make up valuable ground in the WC race. Have to take advantage of these opportunities. The match game won’t do us any good at all. 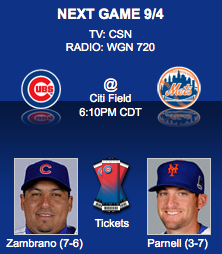 Heading to Citi tomorrow to watch Zambrano take on the Mets. Let’s hope the bananas and fluids are on the menu this evening and the mechanics come out to shine. Need Z to dominate tomorrow and for the first time this season, Go Arizona (they’ll be playing the Rockies). Tick tock boys. Let’s get some runs and make up some ground! Go Cubs Go! When my brother was about seven years old or so, he got a toy called Teddy Ruxpin. This robotic creature was a cross between a teddy bear and a boom box. It had everything. Cassette deck in the back to play the storylines, storytelling ability, soft exterior making it an attractive soft teddy bear best friend and a mechanical inside making the whole thing work. Wasn’t a whole lot this little guy couldn’t do. Was the go to toy that year and was easily the most popular kid’s entertainment around at the time. Had a best friend named Grubby who was a fatter, sloppier version of Teddy Ruxpin, yet still had the same mechanical make up, great for entertainment, just not as sharp on the outside and not the number 1 guy in toy sales that year. This year, Ted Lilly is the Cubs Teddy Ruxpin. Sounds ridiculous I know. But this guy is the man this year and there isn’t much he doesn’t offer. Eight solid innings today giving up only four hits shut down the Astros and gave the Cubs a much needed series win. Like I said yesterday after the night cap W, currently quoted on the MLB.com home page (at the time of posting anyway….September is the season for scoreboard watching. And now after Lilly did his thing, we have to sit and wait. But Lilly was the man today. Eight innings, base hit…trying to generate and manufacture runs by attempting to even steal second base. Unsuccessfully of course, but still the fire and desire was there. Aside from Lee’s going yard for 2 runs, today was all Lilly. Can’t blame him. All quality starts since the break and just one win to show for it. The Cubs offense hasn’t shown up to support his brilliant pitching so of course he was out there trying to grind in the runs himself. Whatever he can do to get the W because the Cubs need them now more than ever. Hardly any season left and it’s on every Cub to give it all the way Lilly did today. Go a little further. Push a little harder. Do the extra things that help the team end up victorious at the end of the day. Lilly’s effort, heart and desire today is what we need day in and day out. Clearly the wild card victory is Colorado’s to lose, but let’s keep winning and keep the pressure on them to win or else give up ground to us DAILY. No time to waste. Our lone all-star stepped up and set the standard that all other Cubs should look to live up to and surpass if possible. Lee is finally healthy and he’s inching closer to a potential .300 30HR 100RBI season and it couldn’t come at a better time. Bradley prides himself on the fact that the media was wrong to harp on ‘can he stay healthy’ considering he’s hardly missed all that many games. Ok, great. But you need to produce in these games Bradley. Stay hot and produce. Support great pitching performances like the one Lilly put in today. And don’t stop putting the pressure on those above us. 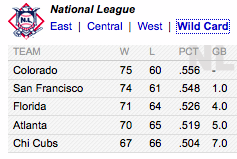 Colorado has the Mets, hopefully the Mets can pull their JV team together and upset the Rockies tonight. If so, we’ll pickup a full game in the standings. Atlanta beat Florida last night. Best thing that can happen tonight is for Florida to beat Atlanta. Let them share the beating and games lost in the standings during their intra-wild card standing series this week. If that were to happen and the Giants lose as well. We could be looking at five teams within five games of each other with a month left to play. Gotta love it. Going to Friday night’s game at Citi Field against the Mets. Zambrano will be starting for the Cubs. He would be the Grubby to Ted Lilly’s Teddy Ruxpin. When Lilly pitches, those games are absolutely must-wins. Same with Wells and also Zambrano. Lilly is the unofficial ace of the staff this year with his all-star status and Wells has high expectations to live up to with a stellar rookie campaign as he and Lilly share the team lead in wins at 10. But Zambrano needs to step up and deliver the great story with the mechanical side of him and not continue to simply produce the sloppy, fiery, entertaining outside of Zambrano. He is the official ace of this ballclub and we need to be able to count on him. His games are must-wins as well, so come Friday, that’s exactly what he needs to come away with. Tomorrow we get the White Sox and those games are always interesting. If any one team is going to play spoiler to another, can’t think of any other team better to do so against than your crosstown rival. Let’s hope the pitches keep finding their places and the bats stay hot. First thing’s first though. We did our part today in getting the win. Now, once again, something we’ll be getting real used to over the course of September…time to sit back, stress out…and keep a real close eye on that scoreboard. Thanks MLBlogs for showcasing Prose and Ivy on the MLB.com home page today. I’m sure it helped attract a whole new batch of MLBlog readers, perhaps some Cubs fans, and hopefully some return readers over the course of the final month of the regular season. Feel free to comment regarding anything Cubs/MLB related in the blogs or in the chat section to the right…and enjoy the rest of the season. This one is getting REALLY interesting….Go Cubs Go!